It was a year ago, in the span of one crazy week, when the Eagles signed DeMarco Murray and Byron Maxwell and traded for Kiko Alonso. They were the crown jewels of Chip Kelly’s first offseason after winning a power struggle for control of Philadelphia’s personnel decisions. Now, in the span of a day, all three are gone. This is no accident. 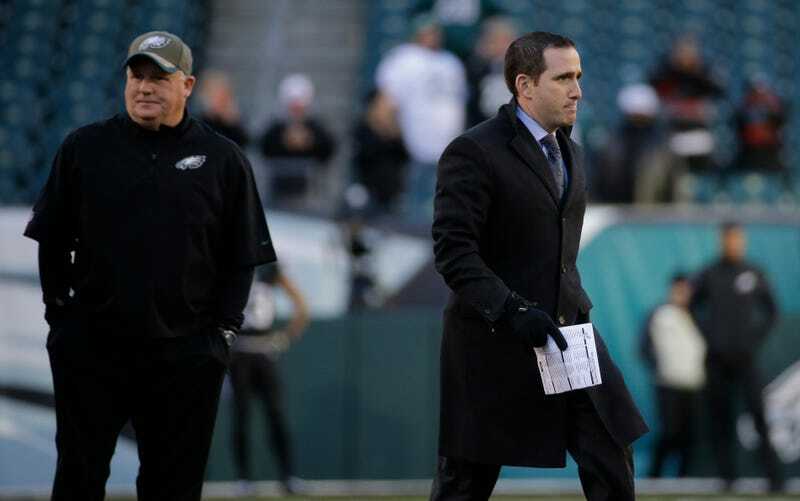 Howie Roseman, VP of football operations, was demoted a year ago. His offices were moved to the opposite side of the Eagles’ complex, the business side, away from everyone who worked with the actual football team. It was the culmination of two years of Kelly’s maneuvering to not only run the team on the field, but to build the roster in his image. Last summer, a dismissive Kelly stated that he wasn’t sure precisely what Roseman did for the organization after being usurped. “I think he does a good job in what his job is now in terms of overseeing contracts, in terms of overseeing all those other things that are under it. I don’t know exactly — there are some things he’s doing — I don’t know exactly what those are. Kelly immediately made a splash, tearing down much of what Roseman had built in his five previous years as GM. And Kelly’s moves—at least the highest-profile and biggest-budget ones, were disasters. Murray was a bust, boasting the single largest yardage drop-off in NFL history for a league-leading rusher. Maxwell proved what most around the league believed; he’s not a No. 1 corner, not when surrounded by a secondary short of the Seahawks’. Alonso failed to recapture his pre-injury, rookie year success. And now, all are out, presumably for not very much. The Dolphins and Titans are expected to send draft picks to Philadelphia, and given the amount of money those teams are taking on in these deals, they won’t be high ones. (I’d be shocked if there’s anything as good as a second-rounder involved.) The Eagles are eating about $9 million in dead money, though they’ve cleared about $10 more in cap space. There are plausible football explanations for each of the moves, though the Eagles’ trading partners clearly believe those players still have value. No, in the long run, this is about Roseman gaining the flexibility to again build a team to his philosophy, something he spent five years doing before Kelly’s coup last winter. Kelly’s one-year stint in charge of player evaluation now looks like an aberration. But Roseman’s been through this before, coming up through the Eagles ranks since he was a kid, and outmaneuvering or outlasting all comers, even before Kelly arrived. But Lurie is fiercely loyal to Roseman, who’s risen through the organization from intern to GM and has been here since 2000. Lurie even kept Roseman over his boyhood friend, team president Joe Banner, when Roseman and Banner were locked in a power struggle a few years ago. Roseman’s best skill may be politics. He’s outmaneuvered Banner and Kelly, always keeping Lurie’s ear and always lurking nearby ready to re-take the reins when the new guys inevitable falls out of favor. He’s good at holding power. That hasn’t necessarily translated to on-field success—the Eagles have been occasionally very good, rarely very bad, but never quite great under his rule—but he’s a master of convincing his boss that whatever the organization’s failures are, they’re not his. Now he gets another chance, and the purge of Chip Kelly’s big acquisitions is consolidation of that power as much as it is any impartial talent evaluation.